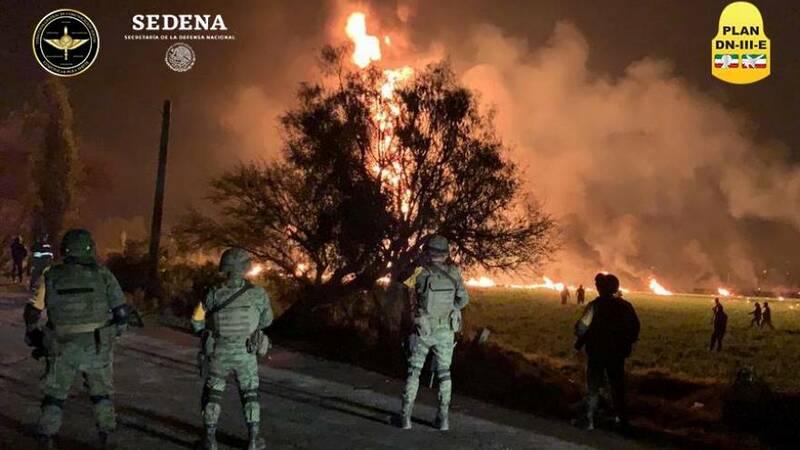 The death toll following a pipeline explosion in central Mexico on Friday evening has risen to 79, local authorities confirmed on Sunday. At least 74 people have been injured. They are being treated in several hospitals, Hidalgo State Governor Omar Fayad said on Twitter. Images from the scene showed a massive blaze with flames leaping into the night sky. State oil company Pemex said in a statement that the explosion was caused by illegal taps in the pipeline. Many of the victims are thought to be people who were stealing some of the oil. According to Public Security Minister Alfonso Durazo, the blaze was contained shortly before midnight. He warned that the death toll could rise as authorities began sweeping the area for bodies. Fayad, who flew over the area to assess the damage, called on people "not to be complicit in fuel theft." "Apart from being illegal, it puts your life and those of your families in danger. What happened today in Tlahuelilpan should not be repeated," he wrote on Twitter. Mexican President Andres Manuel Lopez Obrador said on Twitter that he had been briefed on the incident. "I'm very sorry for the serious situation in Tlahuelipan due to a pipeline explosion (...) I gave instructions to contain the fire and treat the victims," he wrote. The government estimates that fuel theft cost the country more than $3 billion last year and has launched a major crackdown by temporarily closing several pipelines. But it has led to severe shortages in some areas. Pemex also announced on Friday that it was dealing with a separate incident in San Juan del Rio in the state of Queretaro, also due to "illegal taps" but added that "there was no risk" to the local population.